"Journal of some of the great foods,meals, fishermen, farmers, ranchers and cooks that have impacted my life. I am always in search of the next fine food or meal and the people that catch, grow or prepare them. Life would sure be flavorless without those ingredients." Whenever I am in New Orleans one of my favorite stops, and usually my first, is to visit Thomas Stewart, Know as "Uptown T" to friends and locals. I have enjoyed may a dozen oysters at this classic, marble topped, stand up oyster bar. It's the first thing you see when you walk into the bar from the side street door on Dryades St. Pascal's Manale is on the corner of Napoleon and Dryades and as you enter go straight to the bar tender, buy a Red Chip or two, good for one or two dozen oysters. I never have purchased the Green Chip, good for 1/2 a dozen. Usually Diane and I get three dozen to start, then work our way up from there. Five Types of Oysters Grown in U.S. The five types of oysters grown in the U.S. are the Crassostrea gigas, typically a West Coast or Japanees oyster. The Crassostrea sikamen or Kumamoto oyster also a West Coast. Another West Coast beauty is the Ostrea lurida or Olympia Oyster. It is thumb size with a sweet taste and a celery like aftertaste of finish. These oysters are very rare, if you find them on the menu, I suggest you order a dozen. They are a favorite of mine. Ostrea edulis or the European flats and grown on both the East and West Coasts of the U.S. This is the Belon, or the European Flats. Very fragile to ship because they easily loose their liquid. Most of the ones I have eaten have a rubber band holding the two shells closed to prevent them drying out. If on the menu, I will always eat them, but last because of the strong flavor. If eaten first, the other oyster taste will be covered up by the Belon, rich, mineral flavor and a mouthful. Last but not least is the oyster I grew up on, the Crassostrea virginica, or our Gulf Coast Oyster. Having enjoyed and indulged these virginicas all my life, that's my go to oyster and probably favorite. Oyster bars bring out the best in eating and socializing. I always meet the most interesting people sitting or standing around the bar, usually talking about their favorite spots or memorable food experiences. Next time you feel like having a great oyster moment, visit your local oyster shucker, and have a dozen or two. Uptown T is the epitome of what I think a great oyster shucker should be, handy with the knife, friendly, engaging and leave you feeling you are his only customer and best friend. Eating oysters at a classic oyster bar always makes the experience better when you have friendly, experienced oyster shuckers. They know it's essential for a well shucked oyster to always have the aductor mussel cut clean from both shells and presented nicely on ice. What I enjoy about Pascal's Manale's historic oyster bar, the oysters are ice cold then shucked and presented on a white marble counter right in front of you. No platter, but never more oysters on the counter that you can eat in a minute. This keeps the oyster firm, crisp and cold. Never rush eating oysters, enjoy the flavor of each, chewing and slurping every last drop of liquor. Every oyster has it's distinctive taste, slow down and enjoy the Merroir. Take Your Time, Enjoy the Oyster Moment! This Great Oyster Moment captured a couple of years back, brings such fond memories. It was right before Christmas, Diane and I had made a quick trip to enjoy New Orleans, it's food, the Roosevelt Hotel, and it's Christmas decorations. The Holiday Season has always been a hectic time for us. Being in the restaurant, catering, and wholesale seafood processing and distribution business dictates working 24 hours a day for some of our operations. Going on this little excursion always brings me to the right place, Christmas Spirit. I quickly forget about how hard we have been working and remember the reason for this celebration. This particular year we sat at the bar and enjoyed visiting with locals and tourists, walking back and forth to the oyster bar three times, enjoying a dozen each time. Nothing reminds me of Christmas like raw oysters and oyster dressing. That week we had plenty of each. Enjoy Oysters and Holiday Season! I met these two World Renowned Chuck Wagon cooks at a recent Foodways Texas Symposium on April 27, titled Food Routes. The meal prepared, all done from scratch, cooked outside in dutch ovens with coals and could not have been better if it had come from the best kitchens in the country. From homemade biscuits to peach cobbler it was one of those experiences you never forget. We were so lucky to have two of the best chuck wagon cooks prepare this epic meal. I saw first hand why the have won numerous World Championships. Homer making his home made biscuits from scratch, the way they did while working cattle 100 years ago. They were tender, flaky and cooked to perfection. Below Check out this beautiful and delicious Peach Cobbler tended by J. Arthur, the man with the magic touch. It' is hard enough to prepare a cobbler in a temperature controlled oven but check this out. What a terrific weekend in Fort Worth. Foodways Texas has brought together so many nice and interesting people. I would be excited and honored to spend a weekend with any that I have met at any Foodways event. I would love to visit their home towns and explore food through their eyes and eat their favorite meals at restaurants, barbecue joints, cafes, hot dog stands or their of friends homes. "Great Food always attracts Good Friends"
I met Jules in 1979 while buying oysters from Capt. Hayman Pitre in Grand Isle, LA. Jules, a bull of a man, known for throwing two 120 pound sacks of oysters, onto the back of a trailer truck at a time. I had also heard of his grannfather, Capt. Beto Eymard, like Capt. 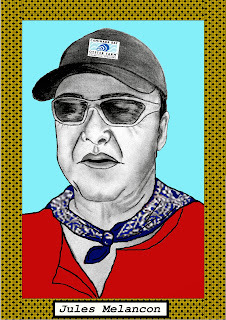 Hayman, both legendary fisherman on the Bayous and Bays of South Louisiana. They were both known for their delicious Barataria and Caminada Bay oysters. When Capt. Hayman introduced me to Jules little did I know a lifelong friendship was born. I started buying oysters from Jules in 1983 and have been a friend of him and his wife Melanie since. We have eaten and enjoyed more oysters together than I could ever count. His passion for his trade drew me in and his love of producing a great oyster his loyalty and tenacious spirit has kindled our lifelong friendship. About eight years ago Jules could see the handwriting on the wall and realized oyster populations would never be like his father, grandfather and great-grandfather's enjoyed and started looking for other choices to focus his passion. He knew that he was not going to see the volume to be able to fully utilize his 65 foot steel hull oyster boat named, My Melanie. A beautiful boat but too expensive to operate with the diminishing stock of wild oysters, crew members and $200 dolllars of diesel a day made it unsustainable. It was March 20, 2010 when giving a talk with author Robb Walsh to an Oyster Industry Convention in New Orleans, that I met Dr. Bill Walton that led to the the Caminada Bay Oyster Company. Bill is the Senior Marine Scientist, Associate Professor, School of Fisheries, Aquaculture and Aquatic Sciences at Auburn University. I had spoken that day of the need to specify the location, reef or bay our oysters are coming from and giving them a distinction rather than a generic Gulf Coast Oyster. This term had been used since the 50's and 60's. Prior the that people knew where their oysters were from on the Gulf Coast. Certain bays and bayous were highly prized for their distinctive taste and flavor and were sold as Bayou Cook, Barataria Bay, Caminada Bay and the such. Bill had mentioned to me that Steve Crockett, in Grand Bay, Alabama was growing oysters from seed, supplied by Auburn's Fisheries lab and was using an off bottom oyster mariculture process. This intrigued me, I asked Bill if I could come down to Bayou LaBatre, AL to see what he and Steve were doing. Knowing that Jules was looking to find another profession, which I know he would never be happy with, I asked him to ride down to see what was going on. I told him if he would be interested, I would help him get started and guarantee sale of all of his production. In return would I have a new hobby and all the oysters I could eat. Little did he know how many oyster I could eat. On the ride home he said " Can you sell them, if so I can grow them". 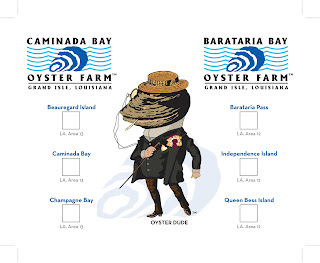 Caminada Bay Oyster Farm was born and now marketed under the Brands, Beauregard Island, Champagne and Caminada Bay Oysters. 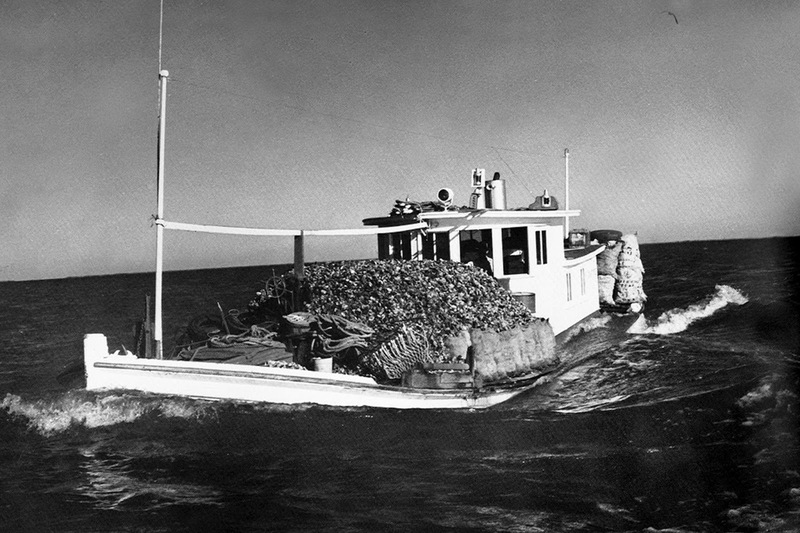 This year Jules started his Barataria Bay Oyster Farm on his grandfather's historic Independence Island. From that farm he will market the Queen Bess , Independence Island and a Barataria Pass oyster. 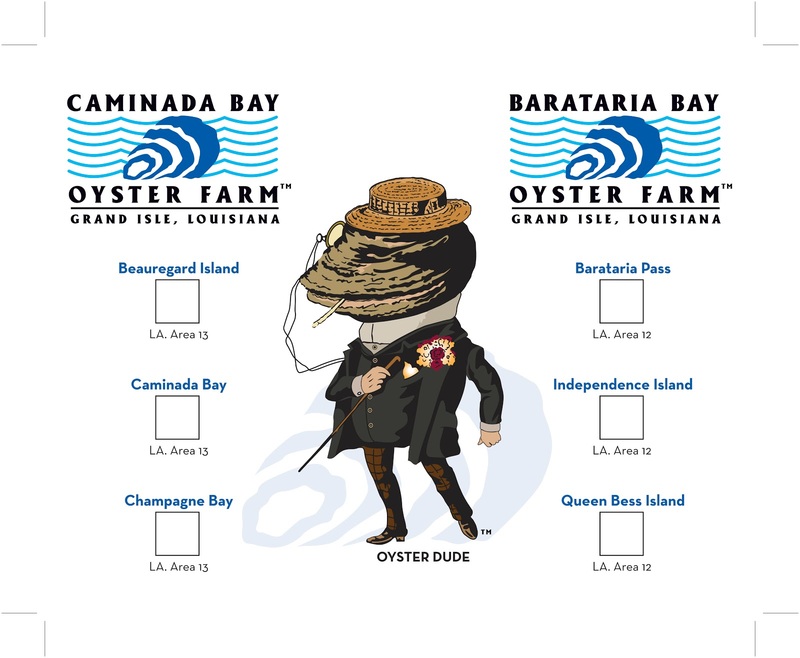 The Barataria Basin yielded an oyster know as the "Aristocrat of the Oyster World", which he hopes to duplicate that taste at his new farm. 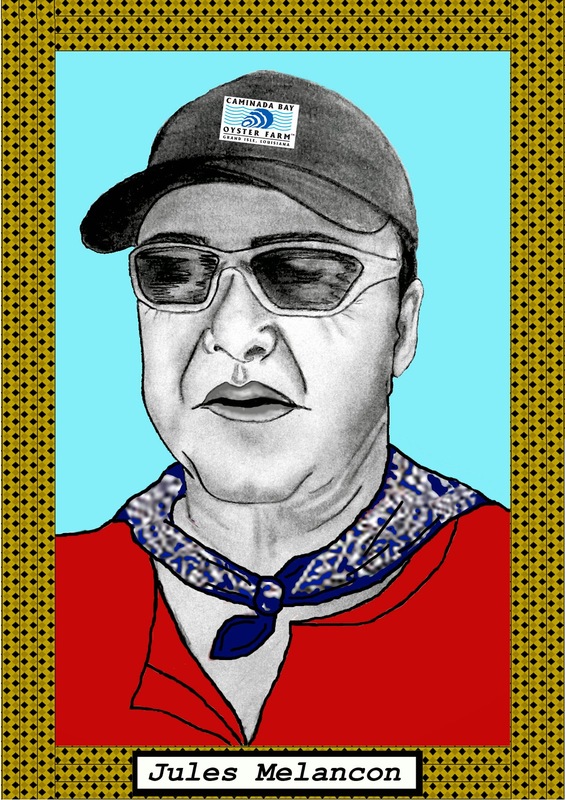 His Barataria Bay farm has been passed down to him for three generations. These oysters below were grown from seed using off-bottom mariculture to compete in the North American Oyster Showcase in Gulf Shores, AL in 2015 and 2016. In Rowan's latest book, The Essential Oyster he talks about Jules' Caminada Bay and Beauregard Island oyster. He says "With cages to protect the flock from marauding oyster drills, he has been able to produce the platonic ideal of a Louisiana oyster: a huge, plump dumpling of an oyster with the biggest adductor I've ever seen on a farmed specimen. The sweet adductor balances the salty belly and gives a lot of chew to the oyster--- just like Louisianans like it". It takes someone that believes in the product because it cost more to produce than a wild oyster! Chef Ryan Prewitt, left, James Beard Award winner 2014, Best Chef: South and his restaurant Peche was honered the same night, Best New Restaurant in America. Ryan was the first chef to help market Jules' oysters and immediately, when asked, said yes, I will proudly sell them at Peche. Jules has found other visionaries that get it, like Dickie Brennan, of the New Orleans Brennan Family of Fine Restraurants and Dan Causagrove of Seaworthy, that have seen the value of promoting locally grown seafood. Thanks to these three gentlemen and those that have reached out for his oyster and giving this new to Louisiana technique a chance. It takes chef's with vision to see that even if a fisherman produces a great product, it takes someone to market and make sure that fisherman makes enough money to stay in business. It takes a successful fisherman to makes sure we continue our Gulf Coast fishing tradition and assures us all access to the best tasting seafood in the world. Jules works his farm alone, with his wife Melanie, helping with the accounting and reporting necessary to run a business. Having built quite a reputation for their terrific farmed oysters, thankfully his demand has outstripped his supply. This has encouraged him to expand and hopefully all those interested in his oyster will have access. We are all lucky to have fisherman with foresight to see that sometimes doing what your grandparents and parents did is not enough and needs a little change. Jules has put down his dredge, hand selecting every oyster he grows! He has changed how he cultivates and grows oysters but like his ancestors is still striving to produce the best tasting oyster on the Gulf Coast! He like his father and grandfathers before him were trailblazers, he's following his own path that is creating quite a wake on the bayous of South Louisiana. He was the first fisherman in Louisiana to apply for and obtain an Alternative Oyster Culture license. Jules proudly shows off his #001 in the State of Louisiana. A true pioneer and visionary for the oyster industry, the way his ancestors were. I met Charles Porier last year when Roxanne Breaux gave Diane and I a bottle of his syrup as a gift. He was only making the syrup for friends and family. He had produced only about 36 - 12 oz. bottles last year with no intention of making any to sell. I asked Diane to find out where he lived and how I could get in touch with him. After tasting the syrup I called Charles to ask him to make more so that other people would have the chance to taste his light, pure and wonderful syrup. I suggested to Charles that if he would grow enough sugar cane to produce 10 cases of syrup, I would purchase it all. This is the reason for my blog, finding people that produce delicious Southern products and Charles is certainly one of them. Now I am the one giving it to family and friends and hopefully you will see Poirier's syrup in stores one day. This small mill was used when they received a load of cane to find out the sugar level before it was sent to the big mill for crushing. Skimming impurities to keep the syrup light and clear. 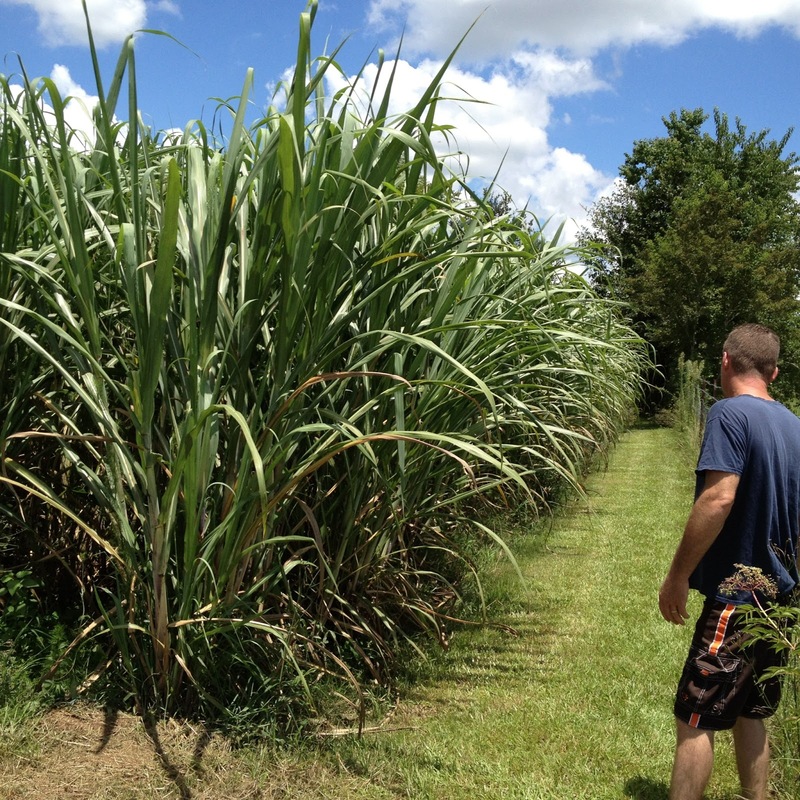 Normally it takes about 125 stalks of cane to produce 15 gallons of juice like show above. After slowly cooking the juice down for 6 to 7 hours the yield is about 3 gallons of syrup. One of the treats of making homemade sugar cane syrup, an ice cold glass of the pure cane juice. This is a two day process, the cane is cut the evening before and the crushing starts at sun up. The juice is cooked for about 6 to 7 hours to the consistency of maple syrup. This syrup is light enough to be put on pancakes or biscuits. Charles is in the process of building a Sugar House for next year's production and hopes to produce enough to sell locally. Everyone should have the chance to try home cooked syrup, cooked the old fashion way... Slowly. I was so excited to see someone revive the process that most sugar cane farmers preformed on their farms in the 18th and 19th century. Most of the sweets in the deep South were made with this syrup in those days and as a child I can remember tasting candy that was a result of cooking the syrup too long. There is a very fine commercial sugar cane syrup producer in South Louisiana and available in stores but to taste this light honey colored syrup is a real treat for me. Below is the recipe for Syrup Cake or Gateau De Sirop made with Steen's cane syrup. Charles' syrup could be substituted and would produce a little milder tasting cake. Heat oven to 350 degrees. Grease and flour a 9-inch square pan a 13 ½ x 8 ½ inch pan or muffin pan(s). Combine oil, syrup, and beaten egg. Stir until well blended. Mix and re-sift dry ingredients except soda. Add dry ingredients to the oil, syrup, and egg mixture alternately with the hot water in which the soda has been dissolved. Begin and end with flour mixture. Jim Gossen. Simple theme. Powered by Blogger.